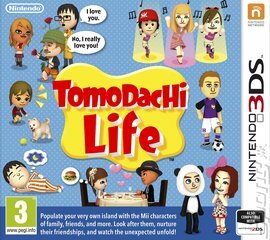 Take the humdrum details of your day to day life and turbo-charge them with a burst of colour, drama and intrigue with Tomodachi Life. 'Tomodachi' is Japanese for 'friend' and the game is all about friendship and the relationships that exist between the people in your life, both real and virtual. Players can customise their Mii characters from top to tail (or even just scan them into the game using QR codes) incorporating not just their looks, but also their vocal traits and personality quirks. They could be your friends' and family's Miis, entirely made up or even based on your favourite celebrities and sports personalities. Players can throw them all into the mix together and see what happens - you're not likely to see much of it coming. A pop star might fall for your mum, your gran might discover a late-blooming talent for heavy metal or you might find yourself living out your virtual dreams by strutting down a catwalk. The only thing you can expect is the unexpected. Best of all, with each new addition you bring to the cast, the plot will only thicken. You can reward your characters with special touches to their apartments, new clothes or their favourite foods. You can get more deeply involved with their lives by solving their problems, expanding the island facilities and just generally helping them with their needs. You can even document these moments, sharing them with friends through the 3DS image share service.